CHESTNUT HILL, Mass. - Delaney Belinskas scored twice and Megan Keller added a goal and two assists, as the No. 9/9 Boston College women's hockey team topped Providence College, 4-2, on Friday afternoon at Kelley Rink. Belinskas opened the scoring for the Eagles less than 90 seconds into the game. The Friars had evened the score at 1-1 by the end of the first but Belinskas scored again midway through the second - her sixth goal in the last four contests - and Keller net the eventual-game winner four minutes later. Caitrin Lonergan's goal at 4:18 of the third pushed BC's lead out to three goals before the Friars capitalized on a power play with 20 seconds remaining. Maddy McArthur finished with 21 saves for BC while Madison Myers had 24 for Providence. The Eagles held a 28-23 edge in shots on goal. The Friars went 1-for-5 on the power play and BC was 0-for-3. Friday, Jan. 25, 2019 | 2:30 p.m.
1st, 1:22 | 1-0, BC GOAL: Maegan Beres got the puck deep into the right corner and Keller was the first to it. The senior had a no-look backhand pass into the slot and Belinskas skated on to it for a one-timer into the upper right corner of the net. 1st, 5:42 | 1-1, PC GOAL: Sara Hjalmarsson cycled the puck for Maureen Murphy to pick up and center to Meaghan Rickard in the slot for a one-timer past McArthur's glove. 2nd, 8:15 | 2-1, BC GOAL: After Keller blocked a point shot, Belinskas fed the puck into the neutral zone for Beres. The two forwards then went in on a 2-on-1 one and Beres drew the Friars over before hitting Belinskas for a one-timer up from the left post. 2nd, 12:19 | 3-1, BC GOAL: Olivia Finocchiaro pushed the puck below the goal line for Newkirk to pick up and carry behind the net. Newkirk circled around the left side and backhanded a pass to Keller for a tap-in at the top of the crease. 3rd, 4:18 | 4-1, BC GOAL: Ryan Little pushed the puck to Serena Sommerfield at the right point and Myers padded Sommerfield's shot the opposite way to a waiting Lonergan to finish at the bottom of the left circle. 3rd, 19:40 | 4-2, PC GOAL: A rebound from a point shot dropped to the top of the crease and Caroline Peterson crashed the net and lifted it over McArthur's left pad. 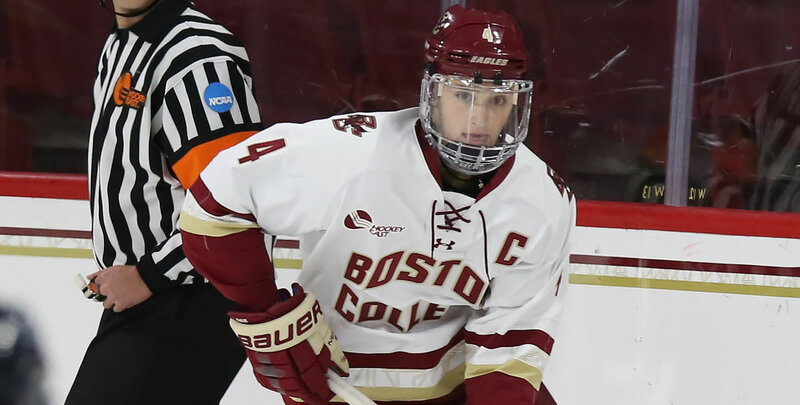 - BC is now 35-37-3 all-time against Providence since elevating to Division I status for the 1994-95 season and 28-6-3 under head coach Katie Crowley ... the Eagles have a mark of 17-17-2 against the Friars at Kelley Rink. - With her three points, Megan Keller set a new Hockey East single-season points record for a defenseman ... the senior has a score line of 13-16-29 in conference games on the season, breaking the previous record of 28. - Keller's 13 goals in conference play on the season are tied for the single-season defenseman record. - With 147 career points, Keller moves into sole possession of sixth-place all-time in program history. - Keller and Delaney Belinskas have each scored in four consecutive games. - Belinskas now has eight points in the last four contests (6-2-8). - Keller's point streak now stands at six games ... Belinskas and Caitrin Lonergan have registered at least one point in four straight games ... Serena Sommerfield and Makenna Newkirk have each picked up a point in three consecutive contests. - Olivia Finocchiaro picked up her first career assist on Keller's game-winning goal. - Ryan Little recorded her 25th career point with her third period assist (12-13-25). - The Eagles have out-shot the opponent in 14 consecutive contests. Boston College and Providence College will close out the regular season series tomorrow with a 3 p.m. puck drop at Schneider Arena.